Have you ever wanted a way to control the electronics of the house wirelessly? Probably like you want to switch on the air conditioner remotely so that the room is at optimum temperature when enter the room, or maybe you feel the need to switch on/off the water heater so the hot water is ready when you enter the bathroom. Or probably you have searched for a way to switch off that light which you always forget to switch off before getting in bed? The smart electronics are on rise these days, but retrofitting the electronics of the whole house might not be an economical choice. Smart power outlet Nyrius provides a cheaper and feasible solution, which is light on pocket and prevents the waste of electricity as well. It allows the user to turn the electronics on and off with the help of a mobile application. This application controls the function of the smart outlet, making switching on and off a simple swipe of the finger. These smart power outlets can be scheduled to switch on and off according to the schedule. Different schedules can be set up for the different power outlets to suit the needs of the users. These smart switches can detect the proximity of the user. They can switch on when the user is in the room and can switch off when he or she leaves the room. 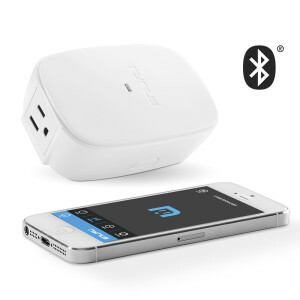 The smart outlets are perfect to control all kind of devices—AC, geysers, stereos, fans, lights or any other device. Each Android operating system can be configured to the control seven smart power outlets Nyrius devices. Each iOS device can be used to control up to four such power outlets. Saving the energy is one of the needs of the hour. It is not only necessary for the future of the world, but also an excellent way of saving money on bills. A huge amount of the electricity bills constitute wasted power because of lights left on, overworking geysers and overlooked AC units. The wireless feature of the Nyrius can help in lowering the amount of wasted electricity. The users can switch off or schedule these equipments as per their requirement. This assures that the power is not wasted unnecessarily. But the project is still in its nascent stage. Huge amount of work is needed for the development and implementation of this idea. The past shows that there are many hurdles to overcome in the development of the project. The first and the biggest requirement is to develop the failsafe technology which will help in making this idea a success. The second challenge is to acquire the requisite tools and manufacturing facility so that the idea is affordable for common people. The third challenge is to get the approval for the required authority to make this dream of smart power outlet a reality. The idea calls for investment of time and money to turn this dream into reality. To know more about the smart power outlets Nyrius, chip in and check out the Kickstarter page and you can be one of the first owners. Previous Entry: What is KeyCDN and How It Can Help You In Your Endeavors? Previous Entry What is KeyCDN and How It Can Help You In Your Endeavors?